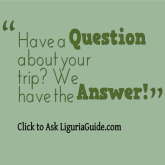 You can find further driving advice and help, in our Travel to Liguria by Car section. Note that traffic is restricted within Portovenere, and you must park your car in one of the surrounding parking zones. As one would expect the closer you get to Portovenere the more expensive the parking becomes. Approaching Portovenere along via Giuseppe Garibaldi, you will see signs indicating the underground car-park next to the entrance of the harbour, as well as continuing down the road there are open-air parking spots on via Olivo, along the seafront of Portovenere. It you are planning to travel to Portovenere by train, you can take the regional rail service to the central railway station of La Spezia. You can find further travel information on ticket prices and time tables, in our Travel to Liguria by Train section. If you decide to go by bus, taking Bus Lines P from Mercato Nord near the Central Station of La Spezia. The journey takes about 40 mins and will bring you directly to the town of Portovenere. The bus lines in the province of La Spezia are maintained by ATC S.p.a. and you can find further details on their website on the routes and tickets options available. If you are arriving to Liguria by plane, you will find that flying to Pisa International Airport - Galileo Galilei is the most convenient option as it is the closest airport to Portovenere (90km away). Your other option is to fly to the Cristoforo Colombo International airport in Genoa which is the main airport serving Liguria and is about 100km away from Portovenere. The other way of getting to Portovenere and around Liguria is by boat — which has the added advantage of allowing you to see the stunning west Ligurian coastline from a distance. 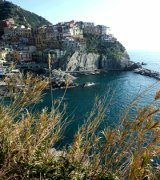 connecting with Portovenere with Lerici, La Spezia and the Cinque Terre villages. For those of you travelling to Portovenere in their own boat, Portovenere's port offers a wide range of mooring facilities include water and electricity.